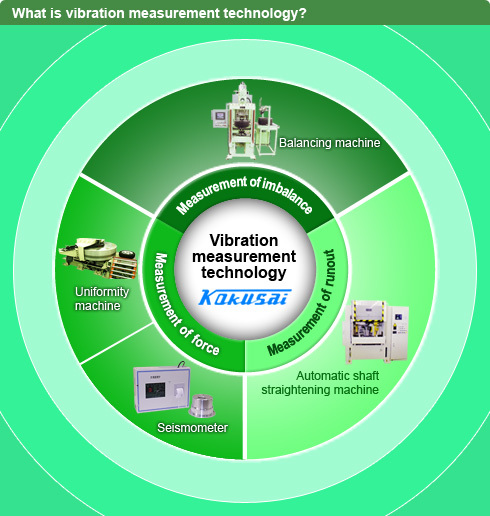 Kokusai’s vibration measurement technology is a general term for the technology that measures and corrects imbalance, force, and runout, which are all causes of vibrations. We develop and manufacture the following products that use such technology. This machine rotates a part while measuring the amount of its imbalance. This machine measures the repulsion that occurs between the road surface and tire when the tire is spinning in a state near to when it is mounted on a car. This machine measures the acceleration of seismic vibrations from all directions (uses sensors placed in the north, south, east, and west as well as vertical to each other, and then processes the resulting waveforms), displays the measured seismic intensity according to algorithms established by the Japan Meteorological Agency and stores the seismic waveforms, and can then retrieve the data at a later date. This network-compatible machine can also send the data to concerned bodies. Automatic shaft straightening machine, gear alignment testers, and shape (runout) measuring machine for wheels and tires, etc. These machines rotate a part while measuring the amount of imbalance it has. * A uniformity test for a finished tire is a check of whether the variability in thickness and strength that results from the manufacturing process is within the standard range of error. The test method consists of mounting the tire on a dummy rim, filling it to the designated air pressure, pressing a drum approximating a road surface against it at a constant amount of force (the amount of load the tire will normally be expected to bear, which would be about 500 kg for a passenger car), and then measuring the amount of displacement in the tire’s repulsion.